There's much discussion about nano flats -- the hottest selling housing units in Hong Kong these days, because many young people are priced out of the market and can only afford the tiniest of flats -- less than 200 square feet. If a couple shares a nano flat, a lot of gymnastics is required to flexibly move around the tiny space, as well as hardly any possessions, but one Hong Kong architect seems to think he has the answer. 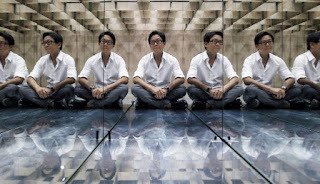 Architect William Lim, managing director of design firm CL3 says: "We should think of them as three-dimensional spaces. We have traditionally looked at spaces as floor plans, but if we start looking at them in three dimensions, we could have different levels within the space." He has created a conceptual flat that consists of two bedrooms, a kitchen and a living room -- in 194 square feet or 18 square metres. 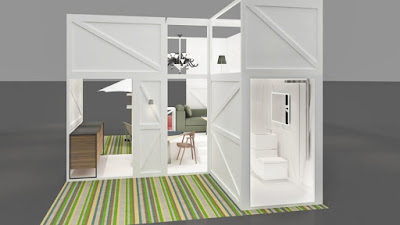 Lim is able to achieve this by putting the bedrooms on top of the bathroom and kitchen. While the concept is not new, particularly in places like Japan, Lim says flats in Hong Kong have a minimum height ceiling of 2.5 metres (8.2 feet), and some are as high as 10 feet, which makes "a flat within a flat" possible. He also wants to prove that a space doesn't have to be completely utilitarian -- the show flat will be decorated with high-end furniture, including a Baccarat crystal chandelier. Lim says when it comes to living in style, quality of space, not quantity is most important. And then his comment of quality of space and not quantity is important is completely out of touch. If someone can barely scrape enough together for a down payment for a 200 square foot apartment, they are not going to be able to afford a Baccarat chandelier, nor would they want one. The same goes for designer furniture. It's all well and good to make a show flat look enticing, but in reality, those who can afford to buy these tiny living spaces will probably hit Ikea and not Tom Dixon. Oh and the ones who can afford to buy more than one of these flats are probably landlords so they won't be installing crystal chandeliers in a rental. We like Lim's idea of trying to use vertical space as much as possible, but he's not being realistic. And the psychological impact of living in tiny spaces can't be healthy. How is that quality of life? Trying to sell nano flats as an idealistic aspiration mocks the people who are struggling to enter the housing market with the tiniest of flats. Size does matter. Totally agree! People like William Lim are not being realistic. He should try living in a nano flat. I'm sure just a few days in even one with quality furnishings will make him change his tune. I think I wrote or heard about architects who look at individual cases of people living in subdivided flats and try to help them make that space as efficient as possible which is a better solution. They also really get to understand first hand the needs of people who live in such cramped spaces.